The defence of the silver medal from the last year's Hungarian Cup failed. We really did fought the lion's share, but this time, most likely, we could'nt get higher. But, lets start the story from the beginning. If you're even occasionally monitoring news on this site, you noticed that competition propositions are often changed, and in this case these were even made ad-hoc, on the basis of an agreement made in the eye of the competition. The team of "Hamburger" from Nagykanyizsa dropped the contest at the last minute, so it was attended by the seven teams divided in two groups of 3 and 4 teams. Games were played everyone with everyone inside the group, and then followed games of the first two teams from groups with crossing, and all the rest of games for the placement, except the final. 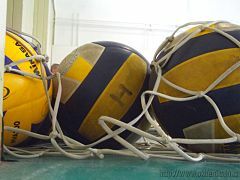 These were played on two courts, so that the break between games was at minimum. Before the tournament, was held a minute of silence in honour of deceased member of the Hungarian national team. 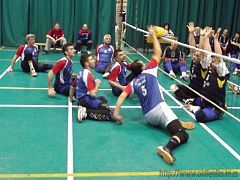 The Hungarian Association of Sitting Volleyball made a decision that all Cup matches will be played in three sets obtained and all in one day including all placement matches, except the final. Subsequently, it turned out that this decision made fundamental problem for the most of the teams. As for us, it has meant that the Cup of Hungary became the hardest competition in which we have participated. "Feniks" had a serious trouble playing versus the neighbours from Szeged. We are congratulating them for the good fight, but especially for their fair play. If it was not so - the referee's errors could easily drag the match into the fifth set. That wont be good from any aspect. We shot this match, so you can see it in our video gallery. We played against Piremon with additional motive, and that is we have not managed to beat them yet, but their play was on the same level as when they withdrew from the scene. We have provided a very strong resistance, much more serious than most of the previous games, but still not enough for something more. Thus, neither of these, nor any other match in the group, did not complete with the surprise. "Mozdulj", as the last year's winners in Cup and Championship, were superior in their group, and the returnee to the competition and perennial champions "Piremon", were so in their group. I have to mention that there are factors that can not be seen at a glance, such as the surface that prevents the most of the sliding motions on the flor, than incompleteness in our training due to the injuries and illnesses of players, changes of team players, the limitations and problems of traveling, the lack of competition in the past two months, and etc. But these are all common things that you simply have to live with. It seemed they played half-heartedly, it seemed we have them. If that really happened, our next match would be played in a week in Gödöllo, together with the Cup of Hungary final in "standing" volleyball. However, they always converted our into their advantage by "some miracle". Of course, it's not a miracle, but the stability and quality of opponent team. In each set we had and the advantages and opportunities, but when we went to some mistakes it was rarely only one, but it turned into a series. Than they split for a few points in a bilnk of eye, they seize it wisely and at last - they earned the finals honestly. In addition, we only achieved to cut into this team once and, sadly enough, they are still holding that level. Sprint has had it's bright moments, but in this game without significant success. The fight for the bronze deserves a more extensive study. Mutual matches of these two teams were mostly interesting and uncertain, and according the historical overview it seems that we were slight favorites. However, this was a game between two wounded eagles. Fatigue arrived to both teams, there was too much efforts, too much power has been spent so far on both sides. We hit the road at 4 am in order to be on time in Tatabánya for the scheduled consultation and toss at 9 am. We started our first match in 11.30, the second around 3.00 pm, the third was somewhere around 6.00pm, and this game started pretty much immediately after the end of the previous one in 7.15pm. Opponents probably have started from home a few hours later, but they had even one match more than us. No matter what this surplus was an easy game against the Hungarian women's team which, as we know, did not won any team, or even set, however, it has to be played. Opponents have a longer bench, but I do not think that was the deciding factor. So I suppose that we were equal in all matters. All other teams have completed their matches and left for home. 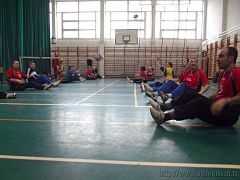 Hour by hour, the night falls a long time ago, so the Maid of the school was tired of these annoying rain, coldnes and wind, and sitting volleyball and ... hardly waiting to "throw" us out and go home ("Oh, my God, it's Sunday ..."). If you pay attention to the following picture you will see that even the organizer was tired of writing results on the bulletin board. Phuh, now that we learned all this, the easiest way to me is to make a parallel with the tennis matches. By that I mean when two guys catch rackets and after "x" hours of hitting the ball no one can't foresee the winner, and they both barely stand on their feet, like these two guys here. You would rather ask yourself a question "Which one of them will fall from exhaustion?" than "Who is going to win?". Without attempting to reconstruct the exact sequence of events, the fact is that we interrupted the match for health reasons: twice because of muscle cramps and once caused by the consequences of hypoglycemia. All this happened to our team members. Dehydration, abdominal pain, joint and muscle pains does not even count. In this milieu was placed the fight of very familiar opponents. Every set we started with a few points lead, then allowed to lose, and than started over. As physical fitness is directly correlated with the concentration, sinusoidal motion of results was not unusual. 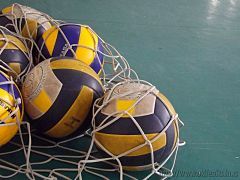 The first set went to opponents by the score of 25:21, with a missed opportunity for the connection at the end of the set. Second, we played a little better, but then we missed two set points. From 24:22 to 24:26, which is something that hurts. In this situation I really do not know where from we got the strength to get the next set, again very close one, 25:23. It was a birth of a new hope, but return to the court after a break between sets did not look promising. Power was on the wane. The next set was the 14th in the order of the day! 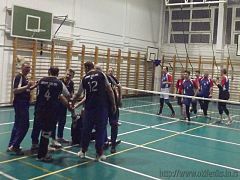 Even this one we played with full effort, but our opponent had that quantum of power more to sway by the result 25:18. "It seems to me that it would be good if this tournament was in the end of the season, not in it's beginning. I've never felt this tired. There remains a regret for the missed opportunity, but in my opinion, there is no place for dissatisfaction. We gave what we could, (and maybe even more). There remains to heal the wounds and move on. We'll see tomorow (in training)." These words came by sms from our video master, right around the time when this article was written. I think they fits this place very well. 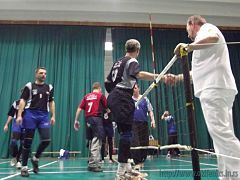 The final will be played in Godollo, near Budapest, 03.03.2013.